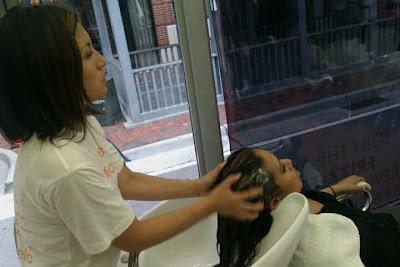 I was recently lucky enough to participate in Avon's Frizz-Free Revolution Tour. The event was also sponsored with Cosmopolitan and I got the chance to xxperience Advance Techniques Frizz Control Lotus Shield as well as a celebrity hair blow out. To see my video experience, click here! We all know the struggle of trying to keep out hair frizz-free, especially in these summer months. Here in Georgia, the humidity is especially bad so fresh hair styles are always in danger of frizzing up. Avon and Cosmo decided to come to the rescue to debut a product that is effective in even 97% humidity. Avon's Lotus Shield ($12) is a leave-in treatment that keeps frizz from happening. On top of it, they're giving the public the chance to have their hair blown out by a celebrity stylist. 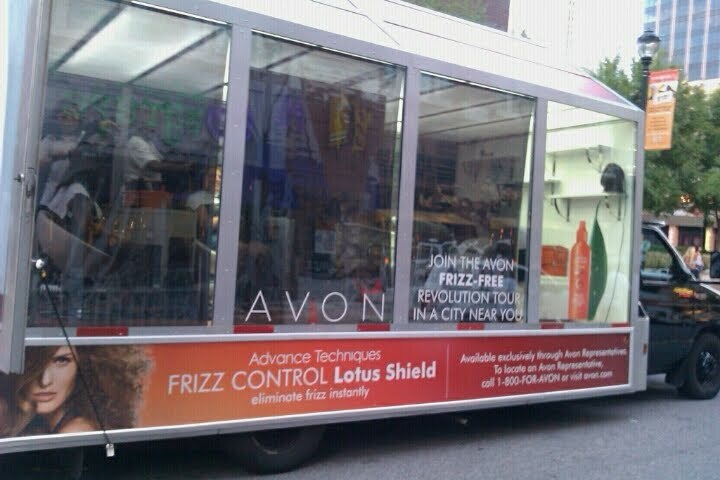 You can stop by the mobile glass-encased salon to grab a sample of the new anti-frizz product and even chat with Avon's Global Stylist Advisor Tippi Shorter who's worked with stars like Alicia Keys and Rihanna. Advance Techniques Frizz Control Lotus Shield is an innovative treatment that mimics the effects of the lotus leaf and forms a humidity-resistant barrier on the hair's surface to control frizz - even at 97% humidity. After just one use of Lotus Shield frizz is eliminated and hair looks and feels soft, smooth and sleek. After one week of use, hair is more manageable and controlled for up to three days. My Philly and New York viewers still have their chance to take place in this super fun experience. Take advantage of it! 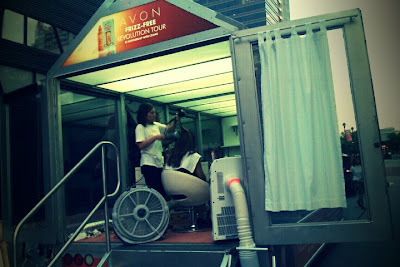 A shot of a salon on wheels! Do you see me in the front getting my hair blown out? Getting shampooed. Apparently they were so busy that day that they ran out of water! LOL they had to finish my shampoo with bottled water...it was refreshing though! Guess who else I ran into? 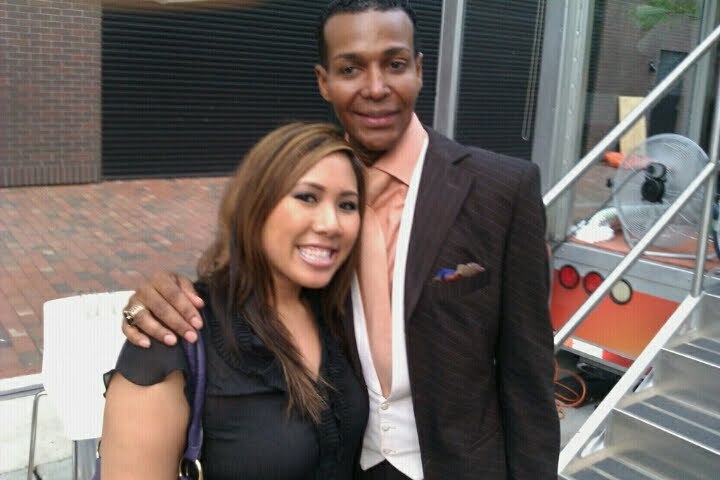 Dwight from Real Housewives of Atlanta! Looking fabulous in his 3 piece suit. He's also a fabulous hair stylist/entrepreneur here in the Atlanta area. He was super nice and I'm so glad I got a picture with him! Don't forget to check out the Lotus Shield at Avon Online or from your local Avon Rep. 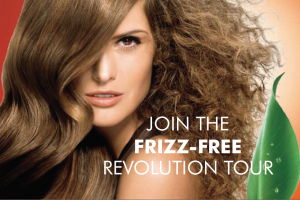 If you're in Philly or New York make sure to check out the Frizz-Free Revolution tour coming to you soon. Goooorgeous! Dwight is so funny..I love when he and NeNe get together! Thanks for the Info my Rep gave me a sample i fell in love with it i ordered 2 this Well, I Will be hitting up the Philly Tour. your hair looks amazing! thanks for the post, i'm definitely gonna look into it! This stuff smells amazing! I love it!